It is no secret that I am a sucker when it comes to animals, especially those in need. I am not exactly sure how I found HAKA – Hawai’i Animal Kuleana Alliance’s HLFARN Lava Flow Network on Facebook, but I am so glad I did. HAKA is one of many groups of people who have joined together to help support the animals that have been displaced by the current lava flow. Last Sunday my husband and, I along with our good friend Shelly, made our way from Waikoloa to Pepeekeo to be a part of a group of volunteers which was organized by some of the folks on the HAKA Facebook page. When we arrived, we were met by Brian Spencer who is one of the owners of the Konahiki Plantation. 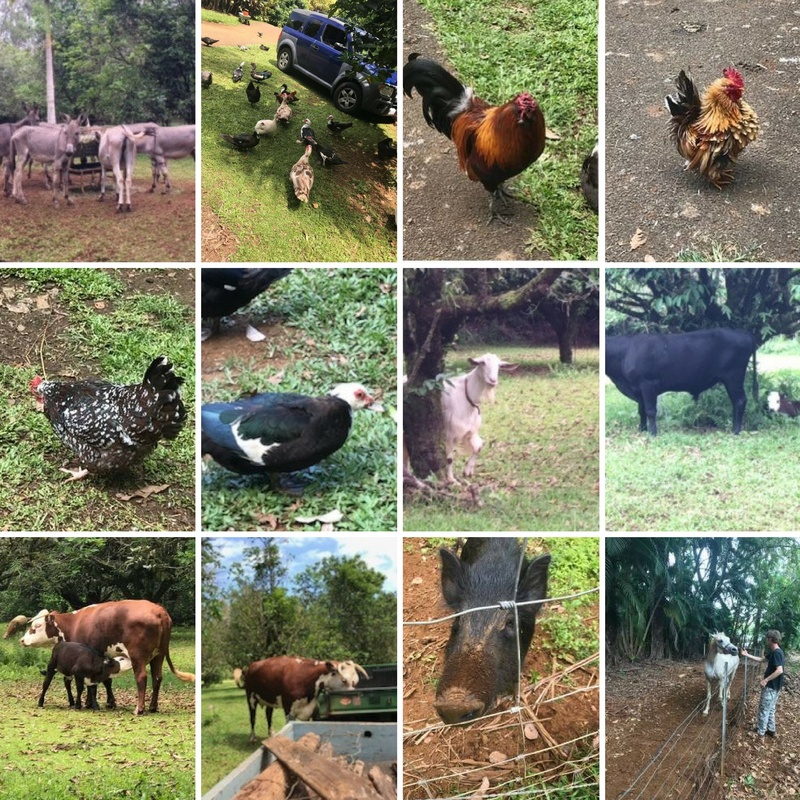 Brian has opened up his farm to over 200 displaced animals, ranging from chickens to horses. This man has such a big heart and has literally turned his life as well as his farm upside down to accommodate the animals. 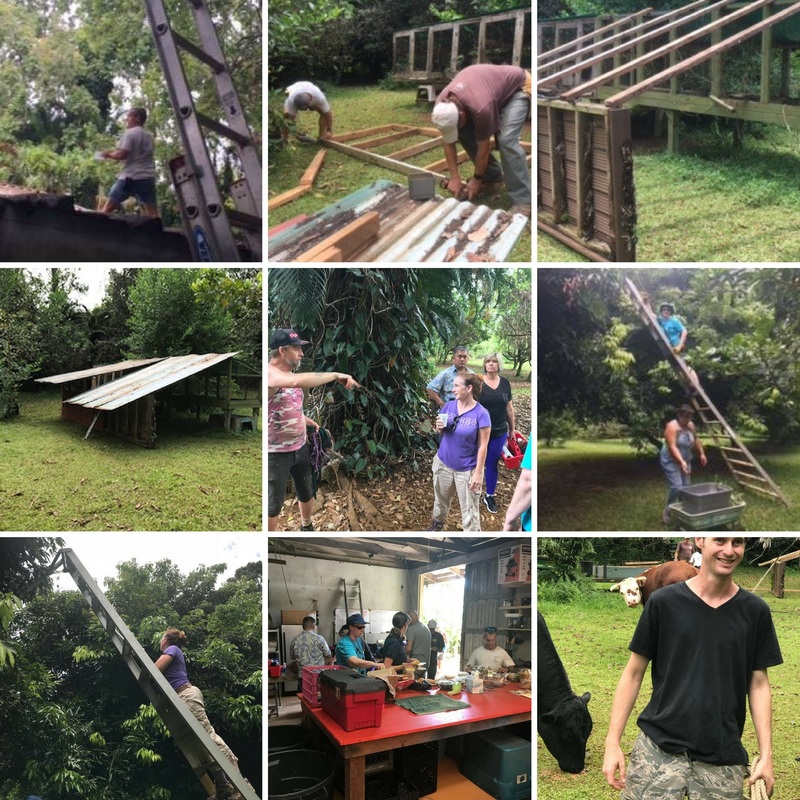 With the help of about 15 volunteers, we were able to repair the roof on his shed, pick lychee, build a shelter for the cows and sheep, and we even managed to make some new friends, both animal and human. One of the most amazing things about this day was the fact that many of us had never met each other. We all just came together for a mutual cause and did what needed to be done. We even had a gentleman by the name of Walt who was here on vacation who jumped in to help. There is still much work to be done at Brian’s farm, as well as many other places that have stepped up to the plate to help. If you are looking for an opportunity to help out either by volunteering or making a donation of supplies or a financial contribution, I highly recommend it. If you need some help connecting with people in need, please reach out to me and I am happy to help. I am also the Vice Chair for the Hawai’i Life Charitable Fund and we are also helping out by matching up to $20,000 in monetary donations. Every bit helps. This is so awesome Linda! You walk your talk and are such an inspiration. I’m coming with you next time! > Mahalo Julie for the kind words. I look forward to volunteering with you next time . So cool that you volunteered for this!